I love these colors. They have brightened up my whole house. Novogratz by Momeni Umbria Geometric Star Pattern Indoor/Outdoor Rug (6'7 x 9'6) - 6'7" x 9'6"
Bask in the carefree, summery colors of this area rug. 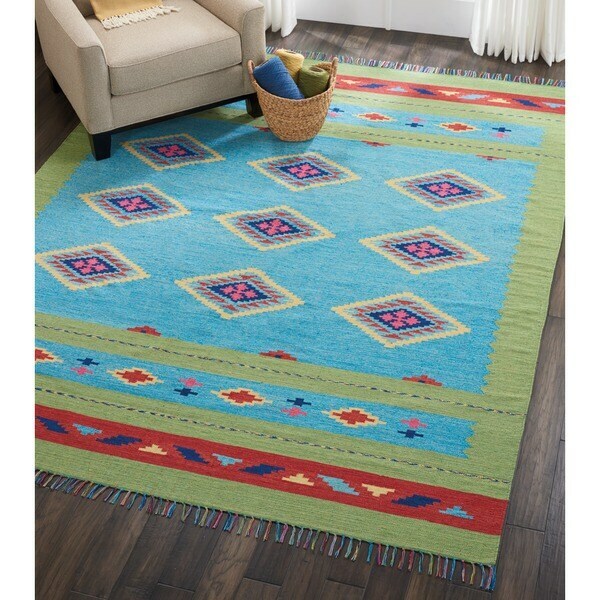 Handmade from a cotton blend for durability and vivid color, this rug features Moroccan-inspired design and a vibrant blue and green palette. The colors of this rug are vibrant and beautiful. It is thin but throw a pad under it & it's fine.